Are you looking to make money from home as an Amazon FBA seller? If so, I am excited to share with you an interview with Jessica Larrew of The Selling Family. Jessica and her husband have been able to make over $1 million in sales over the last 5 years selling through the Amazon FBA program. Jessica has graciously agreed to share some of her story with my precious readers through an interview-style blog post. 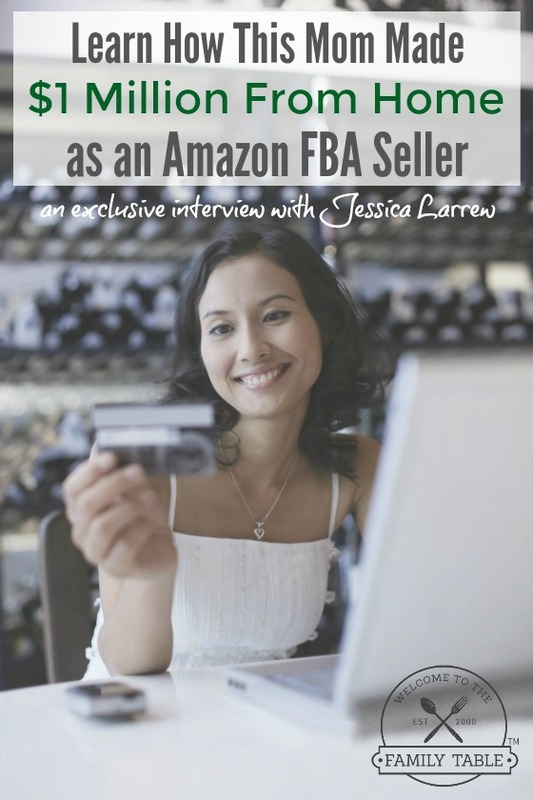 If you are even a little intrigued by her story, you really need to read this interview from start to finish as it’s packed with some fantastic information and resources to help you decide if Amazon FBA is the right fit for you to work from home! How Did You Get Started as an Amazon FBA Seller? I had dreamed of being an online entrepreneur for a few years before learning about selling on Amazon. Even though I had a job, I wanted to create my own schedule and determine my own salary. Plus I knew that one day I’d like to start a family and have the freedom to homeschool. My journey to being an entrepreneur really starts when I was let go from my job in 2008. Since I had been dabbling in selling online already, I decided to pursue selling online full-time. I took my last paycheck and went to yard sales to buy inventory for eBay. Doing that, I was able to replace my previous $1500/month income within just a few months time. About a year later, I set a goal to retire my husband, Cliff, from his job. I knew it would be tough to scale up my eBay business because I had to take care of every little detail when filling orders. Around that time, I heard about selling on Amazon and decided to give it a try. I wanted to replace Cliff’s $5,000/month income, and was able to make that happen in just about a year working mostly nights and weekends, when Cliff could stay home with our son. Basically, we have an online store that’s hosted on Amazon. We’re in charge of finding inventory, which is how we set ourselves apart from other sellers. Then we ship that inventory to an Amazon warehouse, and they store it for us until it sells. Amazon handles everything after we find the items – picking and packing, shipping, and any returns. When you sell through the FBA (fulfillment by Amazon) program, like I do, your items are available for Amazon’s Prime shipping, which is the subscription service where members get free 2-day shipping with a Prime account. This is a huge advantage to me as a seller because Prime products tend to sell at a higher price, and because a lot of buyers only search for items that have Prime. If you have a Prime account, I’m sure you know what I mean about only searching or buying products that are “Prime eligible”. We find inventory from a lot of places, including Clearance aisles, liquidation stores, and Big Box Retail stores. We also sell all kinds of products. There are millions of items being sold on Amazon! We’ve had a lot of success with Health & Personal Care items, household items like kitchen gadgets, Beauty products, and of course toys around Christmas time. It’s a pretty simple concept, but it also has a learning curve. For an introduction to selling on Amazon, we have a free 7-day email series that goes into a lot more details about the process of starting and understanding an Amazon FBA business. What Is Your Favorite Thing About Selling On Amazon? My favorite thing about being an Amazon FBA seller is that it gives me the freedom to choose when I want to work and how much money I want to make. I can spend a lot of hours and money buying more inventory, or I can work fewer hours and only buy certain amounts of inventory. This is also a business our whole family can do together. Cliff and I source for products together, and our son helps us label and box our inventory. Sometimes my mom even helps us out when we are really busy. We chose our business name, The Selling Family, to reflect what our main goal is: to do this together as a family. This year I was also able to realize that dream of homeschooling my son, Aiden. We just started out and we love it! My flexible schedule allows me to work whenever I want to, and we can also have school time when we want. Right now, I work with Aiden for the first part of the day and then work on my business later in the day. Another big advantage to the Amazon FBA business is how little money you need in order to get started. I always say that an ideal situation would be for someone to have $1,000 to invest, which would enable you to get a great training course like ours, get some tools to start off with, and inventory you can sell. A training course is of totally optional, but it helps save time and reduce some of those hurdles new sellers come across. When we started, there were no courses, which is why we developed our own. We wish we had had something like our Amazon Boot Camp when we started! If you already have a smartphone, computer and printer, you can get most everything else you need for $100 or less. We have a blog about the Top 10 must-have tools for Amazon sellers. These are the things that make our life a lot easier, but are things that can be added over time. I’ve been doing this for about 7 years now and I love it! It’s a great business for Moms, whether they stay at home with the kids, work from home already, or work outside of the home. But people do need to realize that this is a real business and it does take time and effort. You need to send inventory in to Amazon all of the time if you want to always have sales. It’s not the type of business where you put up a site and are done. It’s also going to take some time to learn and grow. In our trainings, we always tell new sellers that they should look about three months out before expecting to make a profit. This gives them time to learn the business, find inventory, ship it into Amazon, have it sell, and then be able to reinvest and grow their money to the point where they can take some out for themselves. For anyone who is reading this thinking, “YES, this is exactly what I’ve been looking for!” then we would like to invite you to sign up for our FREE 7 day course to selling on Amazon FBA. This will fill in any blanks we couldn’t cover here and get you on your way. I currently work from home, but haven’t yet reached the salary with my current business that I would like. I know of people making money from selling on eBay, Amazon etc, but had never heard of Amazon FBA. It’s definitely something I’ll be looking into.